Poet and academic Adele Ward takes a critical eye to the form, themes, and emotional undercurrents of Cyclone in her latest review for London Grip. She praises both its craft and handling of emotionally difficult subject matter, and even picks up on obscure references I feared would be all but lost on most readers (such as the Tasmanian devil cartoon and Judy Garland’s opioid exploitation). It is heartening to encounter any reader so invested in undestanding the work, let alone one willing to set down their ideas so thoughtfully. You can read the full review on the London Grip website. Rachel Carney of the Created to Read website gives a sensitive, perceptive read of Cyclone. Peake’s style is varied, but all his work is playful and considered, full of irony and interwoven with imagery that reflects the turbulence and chaos of the natural world. Although the themes of grief and nature seem quite separate, Peake’s tone of voice — analytical, questioning, ironic — pervades the collection. You can read the full review on the Created to Read website. As 2018 draws to a close, Cyclone finds itself in some remarkable company as part of The Spear’s Big Reads of 2018 list as a “standout book of the year”. Well, that’s quite enough tooting of one’s own horn for the year. Wishing you joyful holidays and a peaceful, poetry-filled start to 2019. My copies of Poetry Salzburg Review 28 arrived today, with its signature surrealist cover holding nearly 200 pages of enticing poetry and reviews. Among them are two new poems from me — “The Computer Programmer’s Wife”, to which I expect many a beleaguered techno-spouse might relate, and the off-kilter Anglophonic lament “Getting On With It”. I am also looking forward to mining out new nuggets from familiar names like Piotr Florcyzik, Kim Moore, and Rob A. Mackenzie. If you’re at all intrigued by any of this, you can order your copy of Poetry Salzburg Review 28 directly from their website, or better yet subscribe. 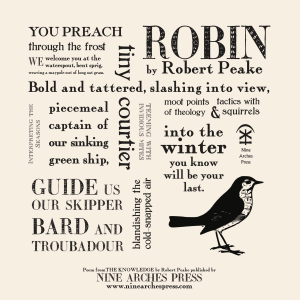 I have had poems coerced into handmade paper via letterpress printing techniques, laser printed on broadsides sheets, and even hung like advertisements in shop windows. 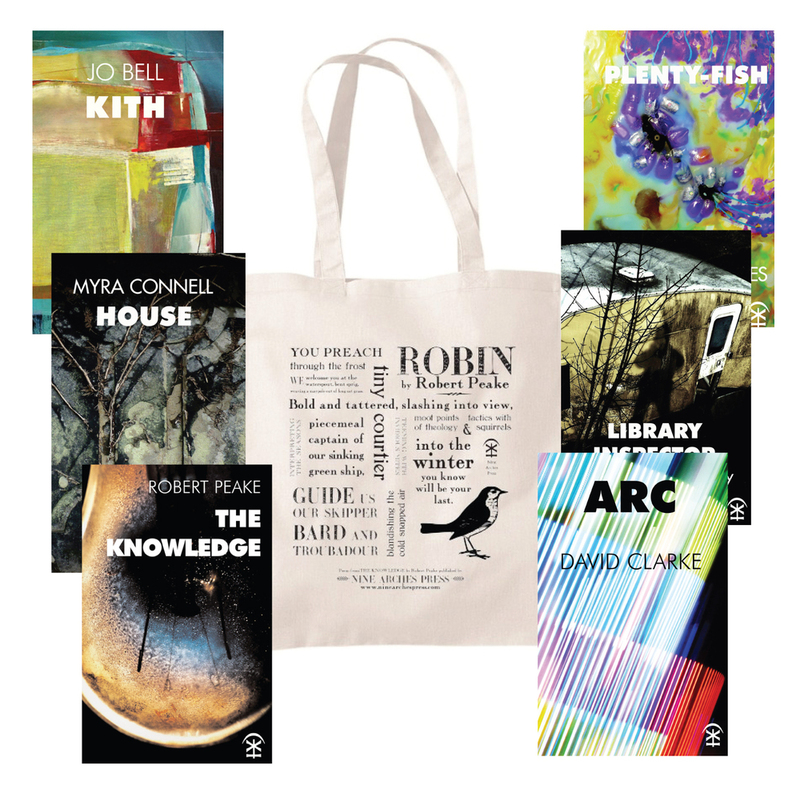 I am really excited, though, to have a poem on a tote bag. Not just any tote bag — a concrete interpretation of my poem “Robin”, beautifully designed by Jane Commane, on a classy natural canvas bag. 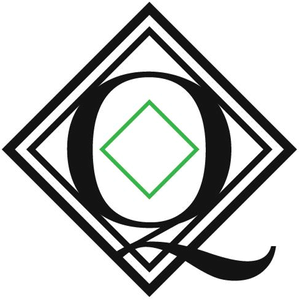 It comes free with a subscription to the Nine Arches Poetry Book Club — itself an excellent idea that gets you six fine single-author poetry collections hot off the press, discounts on other books, and special invitations. Gift wrap available. Really, I hope they made enough bags! I also like the idea that using this tote instead of a plastic bag might help a scruffy robin survive the long winter of our global mass-consumption. As they say in the UK: “Bagsy!” And in my native California: “Totes amazeballs!” You get the idea. I’m exited. The whole site is crisp, smart, and well worth revisiting.